O’Connor’s life story encompasses the sensitive subjects of deprivation, domestic abuse and criminality which would not normally be appropriate topics for this website. We do not usually make personal biography a focus of our coverage, but O’Connor himself emphasised how his early experiences informed his television plays, as did contemporary reactions to his work, and it is important for us to understand his background to understand his work. The following account of O’Connor’s life before becoming a television playwright is drawn from O’Connor’s autobiography The Eleventh Commandment.1 Aside from the basic details of his murder conviction, reprieve and release, it is not possible to independently corroborate any of his reported life story. In view of O’Connor’s early life of dishonesty and later career as a storyteller, one may be inclined to wonder how far his account can be trusted to be accurate. We leave this for the reader to determine for themselves. James O’Connor was born in London on 20 May 1918 to Irish parents. His father was unemployed but made ends meet as a small-time thief and conman. His mother worked as a prostitute. According to O’Connor’s account, his father was a violent man, regularly beating his wife, causing resentment from the young O’Connor. O’Connor reports that once he ran away from home and lived on the streets after his father lunged at him with a knife in response to the suggestion that he get a job. As a child O’Connor turned to stealing to put food on the family table. Later, as a teenager, he mixed stealing with spells of legitimate work, working as a barrow boy and on the railway, although the exact chronology is a little unclear in O’Connor’s telling. As he got older, he started to work in gangs and the scale of his thefts increased. One was a smash-and-grab raid on a jeweller’s shop with a pony and cart for the getaway. At 15 O’Connor had his first spell in prison and from then on had regular appearances in court. He would be fined or, when he couldn’t pay, detained for short spells. On the outbreak of war in 1939, O’Connor joined the army with the express intention of using it as an opportunity to further his criminal career. He joined the Expeditionary Forces Institute, which provided NAAFI services in combat theatres. A bribe hastened his despatch to France where, as a corporal, later a sergeant, he was in charge of a tobacco and spirits warehouse, from which he systematically stole, resulting in a personal fortune of £20,000 in cash. He only stopped stealing when he recognised a newcomer as an undercover CID man. As the Germans advanced through France, O’Connor found himself caught up in the frantic scramble of the British retreat. A small shrapnel wound turned septic and he was given priority for evacuation from the west coast port of St Nazaire, some two weeks after the more famous evacuation from Dunkirk. O’Connor boarded the Lancastria, which was soon attacked and sunk with an enormous loss of life. The Lancastria’s sinking was, and remains, Britain’s greatest maritime disaster, but news of the loss was supressed in Britain.2 O’Connor was lucky, holding onto a raft until he was rescued by the Cambridgeshire which returned him to England. The bulk of his loot was lost at sea. When his superiors learnt of his criminal record, O’Connor was discharged from the army. In civilian life, O’Connor returned to crime, notably a campaign of burgling jewellers across southern England. He spent the second half of 1941 in prison following a further conviction for theft. On his day of release in January 1942 he was rearrested and charged with murder. He was accused, along with another man, of killing a coal merchant during a robbery in Kilburn the previous April. O’Connor maintained that he had an alibi and that a stolen watch that supposedly connected him to the robbery actually came from a burglary he’d committed in Bath. According to O’Connor, his trial was perfunctory, with a poor performance from the defence counsel. Whereas his co-accused was acquitted, O’Connor was convicted and sentenced to death. He spent the next eight weeks in the condemned cell at Pentonville prison with the constant presence of prison guards, as procedure decreed. He was confirmed in the Catholic faith in the blitz-damaged prison chapel. When his appeal was heard, O’Connor became confident of acquittal as one of the judges questioned some of the prosecution’s evidence. It was therefore all the more shocking to him that the appeal failed. He was scheduled to hang on his 24th birthday. O’Connor wrote to the Home Secretary putting the facts of his case as he knew them. In particular, he disputed the evidence of a witness who, O’Connor claims, was the receiver of stolen goods to whom he had given the allegedly incriminating watch. O’Connor reported in his memoir that many years later this witness admitted his evidence had been invented after he was coerced by a corrupt detective. Just a few days before his execution the Home Secretary granted a reprieve, commuting O’Connor’s sentence to life imprisonment. O’Connor subsequently spent nearly 11 years in various prisons, including Dartmoor where he found conditions harsh and prisoners mistreated, and the more enlightened Parkhurst. He lived among other reprieved inmates and violent offenders, learning of their backgrounds and criminal careers. He studied philosophy and psychology from books and turned to his own writing. He took a correspondence course in drama from an Oxford college and wrote short plays to pass the time. The tutor said his writing was too violent. When he was released on licence in 1952, O’Connor set about trying to prove that he was innocent of murder and drew newspaper interest.3 O’Connor later claimed that when he confronted the detective who had been responsible for the case against him, he was told to drop the matter or he’d be framed once more, with his solicitor (who had been listening in) making a sworn statement of the accuracy of this report. O’Connor used his knowledge of crime and criminals to become a newspaper reporter for the weekly Empire News. On one awkward occasion he was introduced socially to Albert Pierrepoint, Britain’s chief hangman, who would have been the one to execute him had he not been reprieved. O’Connor reports that he later interviewed Pierrepoint about his unusual career. 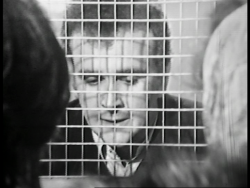 O’Connor reported that in the mid-1950s he provided the dialogue for a BBC drama documentary about prisoners called Beyond the Gate, but had to go uncredited because his name would have been a barrier to shooting in a real prison. I can find no trace of this production but if it was broadcast as a documentary or as part of a current affairs series it would be harder to trace than a drama.4 Later he opened a used cars dealership, but gave it up when he sold his first full television play to the BBC. He also met and married the upper-class barrister Nemone Lethbridge. The marriage had to be kept secret because of Lethbridge’s profession and, indeed, O’Connor reports that when the secret was eventually revealed she was made to give up practicing by the head of her chambers. O’Connor’s television play 3 Clear Sundays was named after the minimum period that the Home Office dictated must elapse between a sentence of death and the condemned man (or woman) being executed.5 It was the story of young barrow boy Danny Lee who finds himself sentenced to a short spell in prison after being provoked into punching a police detective. In prison, two gangsters connive to have Danny allocated to their cell, where they take advantage of his naivety. They convince him to attack a warder: the plan is that they will have their sentences cut for intervening to save the officer, while Danny will have a substantial cash reward for his part upon his release. His concern for his pregnant girlfriend Rosa’s financial needs compels him to cooperate. The plan goes wrong when Danny’s blow to the officer’s head kills him. Danny is convicted of murder, sentenced to death and hanged. Unsurprisingly, O’Connor paints convincing portraits of prison life, the criminals Danny encounters and the horror of life in the condemned cell. But it would be a mistake to see 3 Clear Sundays as autobiographical in anything but the loosest sense. Although Danny Lee hails from a family of petty criminals, as O’Connor did, he is honest and hardworking, unlike O’Connor, who was already a well-established crook long before his murder conviction. One hot-headed action results in Danny’s imprisonment and it is easy to imagine that he would have continued a law-abiding life after his release, had it not been for the gangsters who exploit his anxieties about his pregnant girlfriend. Interestingly, O’Connor himself is represented in the drama as the minor character Michael Carney. Carney’s background, including a murder conviction and eleventh-hour reprieve, exactly mirrors that of O’Connor. Carney appears only briefly in two scenes and has no role in the plot, but his presence serves to highlight the uncertainty and frustration of a reprieved convict who has no confirmed release date to look forward to, a situation O’Connor had experienced for many years. These scenes also illustrate how long-serving and well-behaved prisoners, particularly those reprieved from execution, can become almost heroic figures within the penal system, being awarded a measure of respect and esteem even by senior prison staff. Despite his accidental killing of the warder, Danny (as played by Tony Selby) is portrayed as a decent and likeable man. This is essential to the thrust of O’Connor’s play: to make the point as plainly as possibly that capital punishment is brutal and needless. The effect would have been much diminished had Danny been portrayed as a hardened, callous criminal. Danny’s character is contrasted with that of his mother, Britania (‘Britty’), a ‘fence’ for stolen goods who sends her other sons out to steal to order. Her venality is sharply highlighted by the script, with her attachment to Danny being articulated in terms of money. “He’s always been a good son to his mum and given me money,” she says. Britty opposes the idea of Danny marrying the pregnant Rosa until she learns that Rosa’s father has promised Rosa money upon marriage to a “worker”, whereupon Britty becomes very affectionate towards her. Later Britty is “looking after” money paid to Rosa by a journalist. After Danny is condemned for murder, Britty bemoans that this manner of death means that she will forfeit the life insurance money that would otherwise have been her due, which O’Connor reported was his own mother’s concern when he was condemned. 3 Clear Sundays was made for the BBC’s drama anthology series The Wednesday Play (1964-70), which at this time was experimenting with form, for example mixing storytelling techniques such as narration, animation and montage. Here, folk songs with new lyrics (by Lethbridge) are used between scenes, hinting at a mythic quality to the story with Danny as an archetypal tragic folk hero. The drama ends on a documentary note with three captions: two of the captions quote from evidence heard in the 1950 Royal Commission on Capital Punishment, the other from Arthur Koestler’s Reflections on Hanging. All three document the sometimes-horrific practicalities of hanging. Ken Loach’s direction otherwise favours a highly naturalistic aesthetic, giving the play an intriguing mix of styles. Here Loach employs a handful of actors with whom he would go on to work repeatedly, including in future O’Connor dramas. A group of professional petty criminals nurture the friendship of Archibald Cooper, a man who has made himself a respectable millionaire with a campaign of bribery, dishonesty and conspicuous support of respectable causes. During the course of the play he learns he is to be knighted in recognition of his charitable work. Using Cooper’s land, the gang are able to access the temporary strong room on an unbuilt airport terminal in Southampton which holds gold bullion. They use the local Hunt ball, hosted by Cooper in his role as a pillar of the community, as their cover. They go from hobnobbing in evening dress with the landed gentry – and local police Chief Inspector, who sings Cooper’s praises – to conducting a highly professional bullion raid, and back again before the alarm is raised. Cooper’s friendly relations with the police enable the gang (carrying the stolen gold) to pass through police checkpoints unsearched the next morning. O’Connor uses the gold bullion heist as the device through which to expose the corruption and hypocrisy he saw practised by apparently respectable society. Throughout the play O’Connor depicts the ways, both large and small, in which apparently respectable members of the community are involved in some form of corruption. At the start of the play, a publican uses his masonic connections to make an arrangement with the police to allow some after-hours drinking, and towards the end he is shown donating generously to a benefit in aid of the family of a murdered policeman. Meanwhile, blind eyes are turned to Cooper’s more nefarious activities while he gives generously to charity and the Conservative party. The eponymous ‘tap on the shoulder’ is a reference to both the policeman’s touch of the collar when making an arrest and the monarch’s touch with a sword when bestowing an honour. O’Connor is wryly suggesting that the two do not necessarily exist in such separate social worlds as many would like to believe. This gives the play a very contemporary flavour, aligning it with the decline of deference to, and respect for, established authorities and those in positions of privilege, as came to be associated with the satire boom and counter-culture of the early to mid-1960s. The play’s plot may have been partly inspired by the ‘Great Train Robbery’ of 1963, or at least by the public’s interest in similar stories of audacious criminal raids in the robbery’s aftermath. In Tap on the Shoulder, the gang appear to get away with their crime, as the train robbers initially seemed to. However, in a concluding scene of them relaxing at a European resort, one of the robbers reports having spotted a known informant. This, and camera shots highlighting the baleful presence of a waiter within earshot, suggest that, like the train robbers, these criminals may also later be brought to justice, if only as a result of the reward on offer. The possibility that their ‘traditional’ crime may lead to their downfall contrasts the gang with Cooper, who is depicted as continuing to prosper and receiving his knighthood, to suggest that white collar crime is really the crime of choice for the criminal who wishes to safely profit by their criminality. It is a cynical and subversive message that was typical of O’Connor’s outlook and of The Wednesday Play’s remit at this time to be deliberately provocative. The above description misses the crucial point that, despite all its biting social comment, the play is also a comedy. O’Connor’s dialogue is witty and the energetic playing of Lee Montague as the larger-than-life Cooper sometimes gives the impression of farce. However, the drama also revels in a mix of styles, and as directed by Loach, the central scene of the bullion raid itself is highly suspenseful, akin to what might be expected of a more conventional crime drama. O’Connor’s next play, The Coming Out Party is an anomaly in his career, concerning itself with more with a child and the effect his parents’ criminal lifestyle has on him than on the criminals themselves.11 12-year-old Timothy Odell lives with his grandparents in west London, having been told that his father (known as ‘Ricketts’) is at sea and his mother (Rosie) on holiday, whereas in reality both are in prison for petty crimes. He is known as ‘Scimpy’ thanks to his small size upon his birth during one his mother’s earlier spells of detention. When he overhears his grandmother (herself a ‘fence’ for stolen goods) referring to his mother being in prison, he sets out across London to visit her. On being told by a policeman that prison is for bad people, Scimpy steals a charity box in the hope of being reunited with his mother in prison. Instead he is sent to a remand home, from which he escapes late at night with another boy with more experience of such institutions. The next day Scimpy completes his mission to reach the prison, only to learn that his mother was released earlier that day. His father meanwhile has been allowed 24 hours’ ‘respite’ release with the aim of helping his family back onto a legal path. A ‘coming out’ party is thrown for Rosie at her local pub and she is delighted to be reunited (albeit temporarily) with Ricketts. When Scimpy turns up and is spotted by a detective who has been searching for him since his escape, a large-scale brawl breaks out. Ricketts is returned to prison. Shortly afterwards Rosie is again convicted and imprisoned, and again she is pregnant. Under the impression his grandparents will be a good influence, social services return Scimpy to their care only for him to run away and hitch a lift in a further attempt to find his mother, as the play ends. The story clearly has autobiographical elements for O’Connor, whose own petty criminality as a child emerged from a family background of criminality. However, Scimpy is an idealised caricature of a convict’s child; he is self-reliant and bold but without malice, his low-level criminality occurring only as means to be reunited with his mother. O’Connor highlights the seeming near-inevitability of the children of criminals also turning to crime. One error of judgement – as a young child – may condemn Scimpy to the sadly familiar cycle of institutionalisation and criminality. With the police and social services sending Scimpy to a remand home, where he falls in with an experienced delinquent, and then back to the dubious influence of his grandparents (and presumably later his parents if they ever manage to stay out of prison), O’Connor seems to be suggesting that if Scimpy can somehow avoid a life of petty crime it will be no thanks to those who think they’re helping him. The play is not without a touch of O’Connor’s usual satire and irony. It opens with a nun pressing school children for donations for the benefit of deprived children overseas, seemingly unaware of the poverty and deprivation of some of her own charges. Later, when his new delinquent companion has affected their overnight stay in a closed toyshop and they make free with its stock (including, improbably, a fully edible banquet), Scimpy declares: “I’ve never ‘ad it so good”, mimicking prime minister Harold Macmillan’s famous 1957 celebration of Britain’s prosperity. There is also plenty of comedy in the chaotic lives of Rosie and Ricketts, particularly in the telling of the latter’s inept criminal career. As in 3 Clear Sundays, the occasional use of folk songs on the soundtrack punctures the otherwise highly naturalistic aesthetic (indeed, some scenes, such as the late one featuring the social workers, look as if they’ve been improvised). Based around a bank robbery, 1967’s Profile of a Gentleman was a return to more familiar territory for O’Connor.12 Sadly, no complete copy of the play survives in the archives, though its film sequences do exist in isolation. The following remarks therefore reflect an incomplete viewing of the play and the information that can be gleaned from contemporary press notices. The play opens with Johnny May and his gang of petty criminals being arrested after using a minor con trick to affect a pickpocketing. 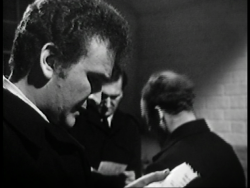 Later, immediately before his release from prison, May is given a message to deliver to the son of another inmate. May plans to ‘go straight’ after one big ‘tickle’. He delivers the message to Eddie, the convict’s son, and learns from him of ‘Codshead’, a ‘respectable’ criminal in the mould of Archibald Cooper, owner of a country mansion and the head of a public company. He is keeping some two hundred thousand pounds in cash, to avoid paying tax on it, in deed boxes in a Belgravia bank vault. The pair form a gang and set out to steal it, using, amongst other subterfuges, a van with temporary GPO markings as cover to access a manhole from which they can (if my reading of the incomplete play is accurate) interfere with the bank’s security systems. Although the heist is a success, Codshead’s gang catches up with May’s. A street fight breaks out between them, and the police are called by local residents. During the melee a shot is fired by a mysterious lurking figure, killing one of the robbers. Both gangs flee as the police arrive, leaving behind the dead body, on which the police find details of a Swiss bank account (presumably the whereabouts or destination of the stolen money). Somewhat confusingly for any viewer familiar with O’Connor’s work, characters or character names recur from his previous plays but they are recast whilst actors from his earlier work (including those who previously played the characters in question) return in different roles. For example, Johnny May is here played by Lee Montague while George Sewell, who played Johnny in 3 Clear Sundays, appears as Eddie. It’s not even clear if this Johnny May is supposed to be the same character as previously, since here he’s depicted going to prison for a very petty street crime, whereas in 3 Clear Sundays he had a reputation as “king of the underworld”, even if some of his talk of his vast personal wealth may have been a ruse. Thirty Stretch, in ITV company Rediffusion’s short anthology series The Gamblers (1967-68), is O’Connor’s only known work for commercial television.14 Although a negative is held in the BFI archive, there is no positive print available for research purposes, so all the following comment on this pay is drawn from contemporary press accounts. Patsy Fagan is sentenced to thirty years’ imprisonment, apparently unjustly, for his alleged role in a bullion heist. With his wife threatening to leave him for another man while he’s away, Fagan cannot face his thirty years’ detention. In prison he is reunited with his brother and other acquaintances who have hatched a plan for his escape. Fagan hides in a boiler that has been emptied for cleaning, aiming to sit out the extensive search for him by the prison authorities. However, after Fagan has been hiding for three days, another inmate who is not aware of the escape attempt or Fagan’s whereabouts refills the boiler and Fagan is killed before his comrades can get help to him. Contemporary accounts suggest that this action was interspersed with mock interviews with the prison personnel, giving the play a documentary aesthetic. As with Profile of a Gentleman, O’Connor reuses a character or perhaps just a character name. Patsy Fagan (here played by John Bindon) was one of the robbers in Tap on the Shoulder (where he was played by George Tovey) and the offence he’s imprisoned for here – a bullion robbery – sounds like the one he committed in the earlier play, but contemporary reviews of Thirty Stretch give the impression he was convicted for a crime he didn’t commit, so as with Johnny May before him, it’s unclear if he should be taken to be the same character or a new one by the same name. Her Majesty’s Pleasure, for The Wednesday Play’s successor Play for Today (1970-1984), was a black comedy of life in a secure unit for criminally insane killers who had been found unfit to plead at trial.16 Although seemingly plotless for a large part of its duration, the play revolves around the annual pantomime staged by the inmates (complicated by the last minute escape of ‘Mother Bear’ for their upcoming Goldilocks production), the arrival of a new young inmate, and long-standing prisoner Woodbine’s personal quest to prove that a man considered unfit to plead can get away with any crime. Woodbine manipulates events to cause another prisoner, the backward and aggressive ‘Jumbo’, to murder fellow inmate Robbie. However, when the preliminary enquiry into the death hears evidence from all the prisoners on the wing, they accuse Woodbine of the crime. The other inmates later learn that Woodbine has been found no longer mentally unfit to plead and that he will therefore be tried for murder. The play concludes with the return of the recaptured ‘Mother Bear’ (who has murdered twice more during his brief liberty) and the staging of Goldilocks. The new young prisoner, ‘Arsenic’, who had previously poisoned his parents and sister, has poisoned the porridge eaten during the performance and three of the prisoners fall dead. Her Majesty’s Pleasure is a strange and grotesque piece, with less of a coherent narrative or argument than seen in O’Connor’s other work. At times it appears to be an outlet for O’Connor’s accumulated criticisms of the British justice system and his myriad experiences of violent criminals from his years in prison. Notably, early in the play, each of the inmates gives an account of the acts which resulted in their incarceration, and these directly mirror those of genuine prisoners encountered by O’Connor and described in The Eleventh Commandment. Most strikingly, Jumbo reports having committed the real-world murder in Kilburn (including correctly naming the victim) for which O’Connor was convicted and sentenced to death, and that another man is imprisoned for it. Although few viewers would have been aware of the personal real-world connection, to the informed viewer it is startlingly incongruous and in somewhat dubious taste. 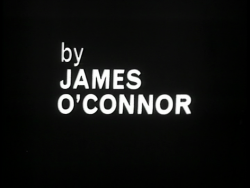 Despite The Eleventh Commandment listing more plays to the author’s name (presumably unproduced or incomplete scripts), O’Connor does not appear to have had any further television productions. It’s possible he spent time working on projects for the cinema. In 1965, a press report suggested that he was writing a screenplay for a Columbia Pictures film based on the Great Train Robbery.17 In his memoir O’Connor claimed to have been acquainted with at least one of the train robbers. This was an appropriate time for O’Connor to turn to the film industry, with British crime films enjoying popular success. However, it doesn’t appear that anything reached fruition unless O’Connor’s involvement was well disguised. If nothing else, it’s easy to imagine O’Connor making the most of script development investments. O’Connor’s later life was turbulent. According to Andrew Weir, writing in The Guardian, “O’Connor could never shake off completely the despair and deprivation of his past, and he began to drink heavily and take out his reverses on Lethbridge and the children.”18 Lethbridge divorced him in 1973.19 She had herself become a distinguished television playwright and O’Connor claimed in The Eleventh Commandment that her drama Baby Blues contained elements based on their marriage,20 with him “portrayed as a drunken husband.”21 Nevertheless, when O’Connor later suffered a series of strokes, Lethbridge helped care for him. He died in London in 2001. Because he wrote only a handful of television plays, O’Connor’s importance is easily overlooked. He came to television at exactly the right moment, offering a perspective entirely alien to the predominantly middle-class and respectable practitioners of the medium so far, just as such fresh voices were being sought for the more contemporary and determinedly controversial drama demanded of the mid-1960s. No other dramatist could write with personal insight about such subjects as life in the condemned cell or as part of the criminal underworld, and with his plays O’Connor widened the sometimes-parochial horizons of the medium while highlighting such significant social problems as the death penalty and the rise of white collar crime. With thanks to the British Film Institute for making Her Majesty’s Pleasure and the surviving parts of Profile of a Gentleman available for viewing via their research viewings service. Originally posted: 31 March 2017. 1 April 2017: minor corrections to expression. 12 April 2017: deleted extraneous sentence caused by previous corrections but wrongly left in place.